Bacon is either cured or uncured while all bacon is soaked in brine to give it flavor and prevent botulism. It is traditionally cured using a mixture of salt, water and synthetic sodium nitrite that acts as a preservative and made by mixing Nitrates, a naturally occurring compound in plants, with certain bacteria. Uncured bacon uses natural nitrates found in juice, sea salt and celery powder to achieve a similar taste, so uncured bacon does not have potentially harmful chemicals akin to sodium nitrite. They are both made from pork belly. They are both soaked in brine to prevent botulism. They are interchangeable when cooking. Both have roughly the same calories. The most noticeable difference between cured and uncured bacon is the means of preservation. 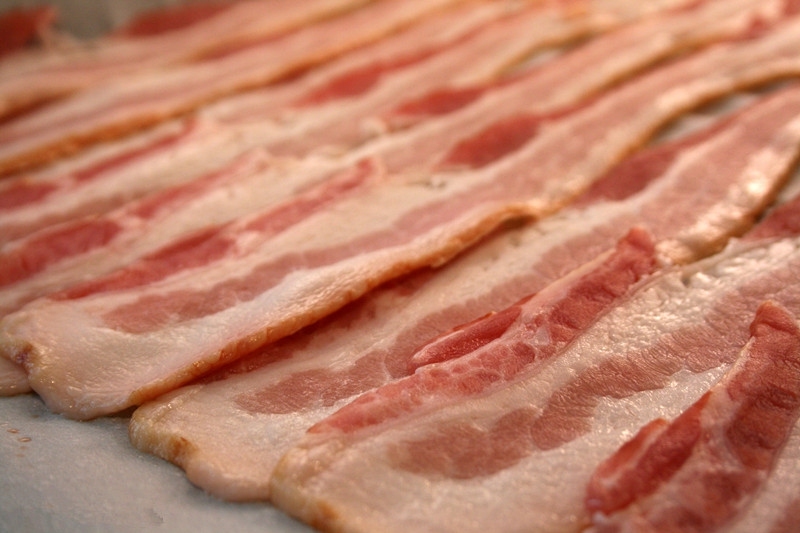 Cured bacon generally relies on chemicals and additives such as sodium nitrate or nitrite. However, uncured bacon often uses more natural salts and flavorings. When choosing naturally occurring nitrates, celery salt is the most common choice. Lactic acid starter culture is also high in nitrates and is used by some producers. Because the natural choices are high in salt, uncured bacon is also often very high in salt. Cured bacon often has a longer shelf life than that of uncured bacon. This is due to the chemical additives in cured bacon which usually keep the meat fresh for longer time. On average, cured bacon will last for several months if kept refrigerated and sealed. Adversely, uncured bacon will only last about a week. There are food connoisseurs that say the flavors of cured and uncured bacon are subtly different, although this is not fully agreed upon. Most nutritional experts will agree that either cured or uncured bacon is very high in fat, cholesterol, and calories. Cured style tends to have man made or “fake” ingredients, whereas the uncured version is higher in salt and sodium. Health food proponents claim that uncured is better since they do not use the chemicals cured versions use. Turkey bacon. As the name implies, it is made from lean turkey instead of pork. This is a good option that can lower the fat yet still has the delicious taste of bacon. Canadian bacon. Unlike most cuts of bacon, Canadian bacon comes from the hindquarters and is lower in fat and calories than traditional bacon. As a comparison, regular bacon contains an average of 165 calories and 14 grams of fat per 1 serving while Canadian bacon contains 50 calories and 2 grams of fat for the same size serving. What a big difference! Bacon flavored salts. This option is not only kosher, it is also vegetarian friendly with lower sodium and zero fat or calories. This is an outstanding option for all bacon-lovers. They can enjoy the great taste of bacon with no guilt attached. Just use it for any food you like.